Meat Solutions has agreed to pay $2.2 million to settle a hiring discrimination case with the U.S. Department of Labor. 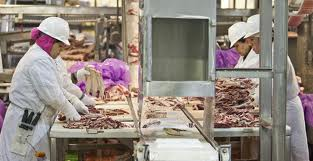 Workers process beef at a Cargill Meat Solutions plant. Even though it say it didn’t do it, Cargill Meat Solutions has agreed to pay $2.2 million to settle a hiring discrimination case with the U.S. Department of Labor.